Drawing on two decades of experience as a war correspondent and based on his numerous columns for Truthdig, Chris Hedges presents The World As It Is, a panorama of the American empire at home and abroad, from the coarsening effect of America's War on Terror to the front lines in the Middle East and South Asia and the continuing Israeli-Palestinian conflict. 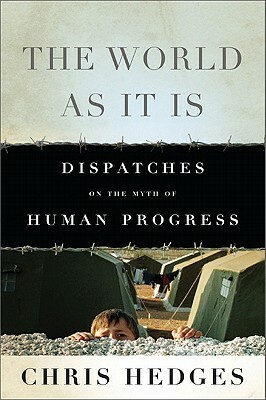 Underlying his reportage is a constant struggle with the nature of war and its impact on human civilization. "War is always about betrayal," Hedges notes. "It is about betrayal of the young by the old, of cynics by idealists, and of soldiers and Marines by politicians. Society's institutions, including our religious institutions, which mold us into compliant citizens, are unmasked. Chris Hedges is a Pulitzer Prize-winning journalist. He spent nearly two decades as a correspondent in Central America, the Middle East, Africa, and the Balkans, with fifteen years at the New York Times. He is the author of numerous bestselling books, including Empire of Illusion; Death of the Liberal Class; War is a Force that Gives Us Meaning; and Days of Destruction, Days of Revolt, which he co-wrote with Joe Sacco. He writes a weekly column for the online magazine Truthdig. He lives in Princeton, New Jersey.